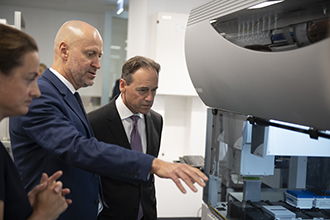 Health minister Greg Hunt has announced the federal government will provide $25 million to help establish a new national Drug Discovery Centre at Melbourne’s Walter and Eliza Hall Institute of Medical Research. The funding will go towards advanced robotic gear designed to enable the centre’s researchers to screen hundreds of thousands of chemicals and rapidly identify which ones can alter processes in the body implicated in a particular disease or condition. Mr Hunt said the investment will help researchers develop new drugs to treat both common and rare diseases. The centre will open in June 2019. The Walter and Eliza Hall Institute’s own contribution to the establishment of the new centre has come from philanthropic support, as well as $32.1 million from the sale of royalty rights for venetoclax, an anti-cancer therapy based on a landmark research discovery made at the Institute in the 1980s. The therapy is being developed and commercialised by AbbVie. "The discovery and commercial success of venetoclax is a leading example of how Australia can benefit from great discoveries, and how as a nation we can continually excel in health and medical research on the international stage," said Mr Hunt.